Following the Mediterranean diet, fish is kinda essential for my family. It’s about the one food that shows up on the menu twice every week. Sometimes, our fish dinners go far–as far as a fish stew from Sicily or an Egyptian-inspired fish Shakshuka cooked in a tasty tomato sauce. 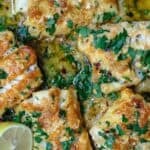 But more often than not, I opt for something simple like pan-seared salmon or today’s baked cod recipe with lemon and garlic. Cod fillet is a beautiful thing. 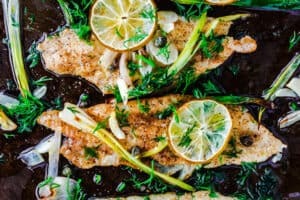 It’s easy to cook, and because it’s a mild-tasting fish, the ways to give it glorious flavor are endless. 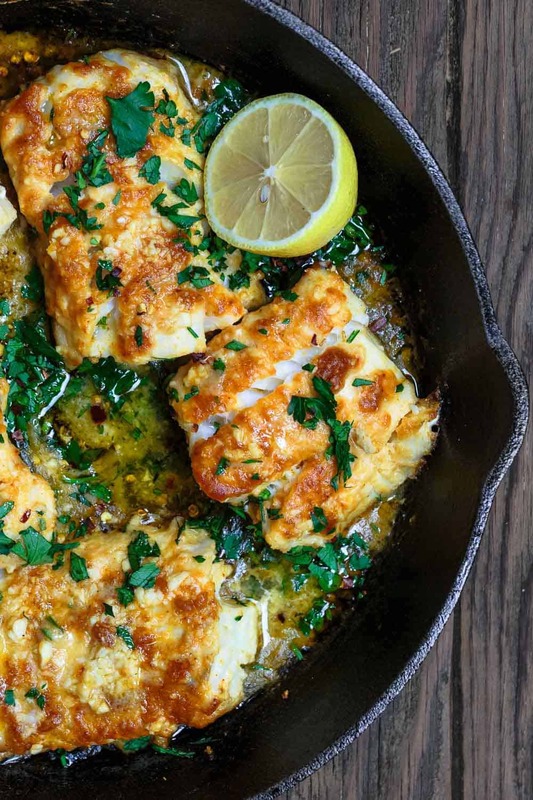 This baked cod recipe takes on a bit of a Greek twist. 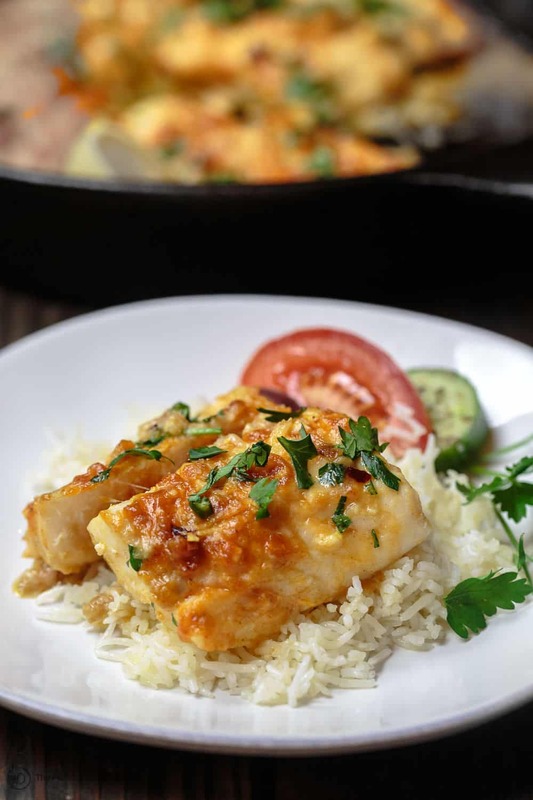 The cod is lightly coated with a spiced flour mixture with coriander, paprika, and cumin. Quickly seared, then baked with lemon juice, Greek olive oil, and lots of minced garlic. 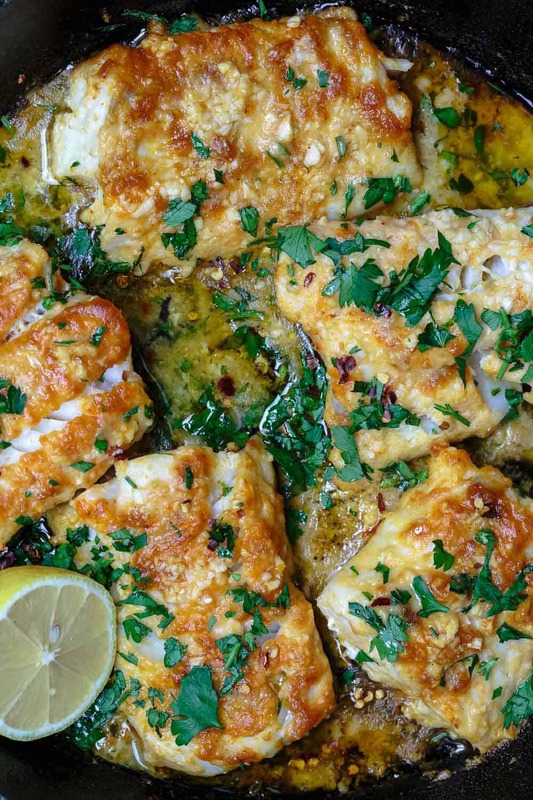 What to serve with this baked cod recipe? It feels like I’m always recommending this Lebanese rice with vermicelli, but it makes the perfect bed for this lemony baked cod. Keep the Greek theme going by adding a side of traditional Greek salad. Or, for a heartier salad option, try this Mediterranean chickpea salad with eggplant. 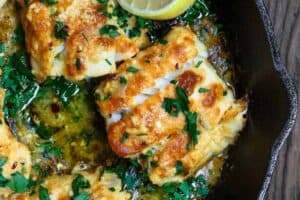 Best baked cod recipe out there! 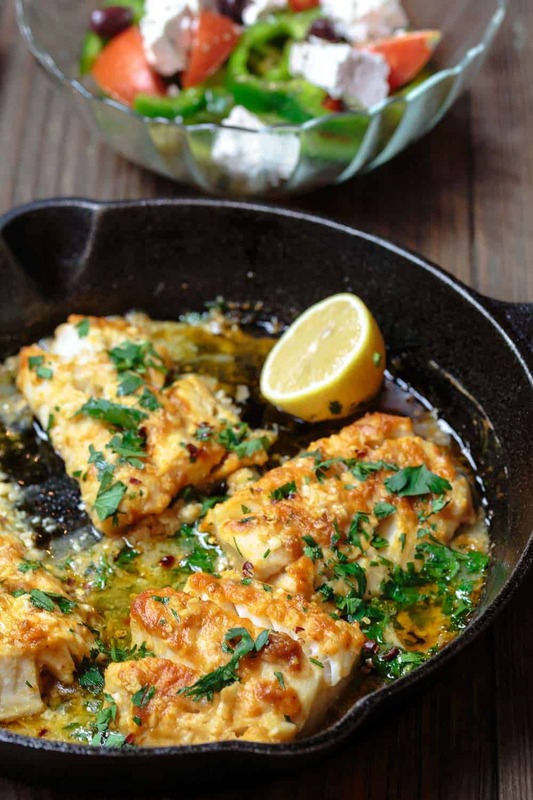 Prepared Greek style with a few spices and a mixture of lemon juice, olive oil and lots of garlic. Bakes in 15 mins! Serving suggestions: Serve immediately with Lebanese rice and this Mediterranean chickpea salad or this traditional Greek salad. 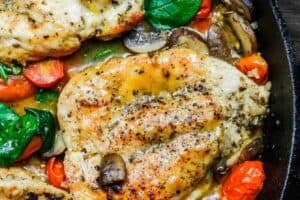 This recipe has been edited adding step #5 to achieve more color and a more crispy texture. Recommended for this Recipe: Our Private Reserve Greek Extra Virgin Olive Oil (from organically grown and processed Koroneiki olives). SAVE! Try our Greek Olive Oil Bundle! And from our organic and all-natural spice collections: Coriander; Spanish Paprika; Cumin. SAVE! 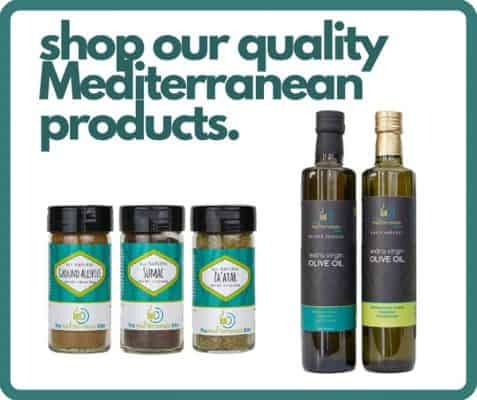 Try our Ultimate Mediterranean Spice Bundle, or create your own 6-pack or 3-pack or our organic or all-natural spice collections! Awesome, Alicia! I’m so happy you enjoyed it. 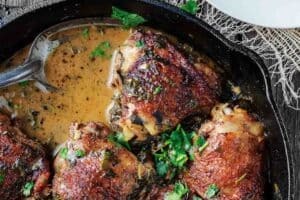 I made this recipe for dinner last night and it was amazing. The flavours are fresh and zingy. It’s definitely going to be a recipe I will make again and again. Fantastic. 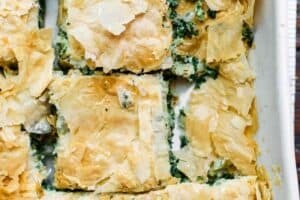 Very flavorful and easy to make. I adapted the ingredients to serve one. Before placing the fish in the oven, I sprayed the dish with fat free cooking spray and added as much baby spinach as would fit. Thank you for a great meal. Great! thanks for sharing your variation, Elaine! Thank you for sharing. I don’t usually like to cook cod because it ends up being dry. However, this recipe was yummy. Definitely will be on my seafood rotation. I’m glad this recipe worked out for you! Thanks for giving it a try! My pleasure, David! Thank you! Really tasty. I’ll probably try panko instead of flour next time to make it a little crispier, but I will definitely make it again! Family really liked it. these nutrition facts are really lazily done. you are assuming someones going to eat all of the butter and oil that you call for in the recipe even though its just meant to coat and drizzle. but the recipe does look good and ill be trying. just a reminder to anyone counting calories, dont trust the recipes cus they often just add all the ingredients up regardless of is they are actually all eaten when the recipe is complete. Had this for dinner last night and it was very good. A little intimidated with turning the fish and not breaking up but it stayed intact. Did mess up by washing the pan before adding the garlic but recovered by quickly mixing more. I do think the garlic was a little overwhelming but I was cooking less fish because of two servings instead of 4. All in all, very good. Thanks again for another great meal! When cooking the fish in the oven, should it be covered or uncovered?